Directorate S: Steve Coll on the CIA & America’s Secret Wars in Afghanistan & Pakistan | Democracy Now! author of Directorate S: The C.I.A. and America’s Secret Wars in Afghanistan and Pakistan, the sequel to his Pulitzer Prize-winning book Ghost Wars: The Secret History of the CIA, Afghanistan, and Bin Laden, from the Soviet Invasion to September 10, 2001. Coll is dean of the Graduate School of Journalism at Columbia University. He is a staff writer at The New Yorker. AMY GOODMAN: The news comes after a particularly bloody period in Afghanistan. Last year, the United States said civilian casualties in 2017 had reached a record high in Afghanistan. Meanwhile, about 10,000 of Afghanistan’s security forces reportedly were killed over the past year. Despite the spiraling violence, President Trump recently ruled out negotiations with the Taliban, during a meeting of members of the United Nations Security Council. PRESIDENT DONALD TRUMP: We’ll also discuss what more we can do to defeat the Taliban. I don’t see any talking taking place. I don’t think we’re prepared to talk right now. It’s a whole different fight over there. They’re killing people left and right. Innocent people are being killed left and right, bombing in the middle of children, in the middle of families, bombing, killing all over Afghanistan. … So, there’s no talking to the Taliban. We don’t want to talk to the Taliban. We’re going to finish what we have to finish. What nobody else has been able to finish, we’re going to be able to do it. AMY GOODMAN: We turn now to Steve Coll, a journalist who has reported on Afghanistan and the region for the past three decades. In 2005, he won a Pulitzer Prize for his book Ghost Wars: The Secret History of the CIA, Afghanistan, and Bin Laden, from the Soviet Invasion to September 10, 2001. Well, now he’s just published a sequel looking at what has happened in Afghanistan since the 9/11 attacks. It’s titled Directorate S: The C.I.A. and America’s Secret Wars in Afghanistan and Pakistan. Steve Coll is dean of the Graduate School of Journalism at Columbia University and a staff writer at The New Yorker magazine. He joins us now in our studio. STEVE COLL: Thanks, Amy. Good to be back. AMY GOODMAN: So, let’s start with your title, Directorate S: The C.I.A. and America’s Secret Wars in Afghanistan and Pakistan. What is Directorate S? STEVE COLL: So, it’s the covert action arm of the Pakistani intelligence service, the main intelligence service called ISI. And it basically has supported the Taliban and other militant groups to pursue Pakistan’s idea of its foreign policy interests in its neighborhood, or at least the idea of its military, which is really in charge of ISI and Directorate S, and which is, you know, the strongest institution in Pakistan and has ruled the country for many of its years of independence. And, you know, the CIA knows all about Directorate S, because they worked with them during the 1980s to defeat the Soviet occupation. That’s the story of Ghost Wars. 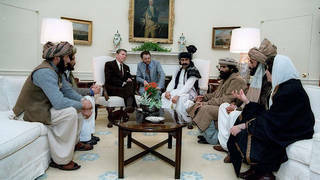 The story here is that after the United States went into Afghanistan, set up a constitutional government, led by Hamid Karzai initially, a few years after that, starting around 2005, Directorate S went back into action, this time not to defeat the Soviets, but to undermine the American project in Afghanistan. NERMEEN SHAIKH: Well, could you say a little bit more, Steve Coll, for our listeners and viewers who don’t know very much about the history of Afghanistan during the Cold War, and of Pakistan—give us a sense of the expansion of Inter-Services Intelligence, Pakistan’s premier intelligence agency. What was it—the scope of it? I mean, now, in Pakistan, it’s come to be known as a state within a state. NERMEEN SHAIKH: How did it come to have the proportions it does now, and also influence over Pakistan’s foreign policy? STEVE COLL: Yeah, well, so, you start with the Army’s influence over Pakistan’s foreign policy which goes all the way back to the 1950s. But the growth of ISI really took place during the 1980s with funding from the CIA and Saudi Arabia to try to help ISI support the Afghan rebels against the Soviet Union in a Cold War proxy fight, right? So, the Soviets invaded Afghanistan in 1979. Afghans rebelled spontaneously against that occupation. Many of them fled to Pakistan. Gradually, Pakistan organized a resistance. And then the CIA and Saudi Arabia came in with billions of dollars. And essentially they contracted ISI to carry out this covert action. And Pakistan insisted on that. They said,”We don’t want a bunch of Americans running around on our frontier. You let us do the work. Give us the funds.” And gradually, they grew into this corrosive force within Pakistan. And they moved beyond supporting groups like the Mujahideen—and, later, the Taliban—into interfering in Pakistani politics, trying to shape media narratives, and essentially become a state within the state. AMY GOODMAN: So the U.S. and Saudi Arabia provided enormous support for Pakistan and, ultimately, the ISI, over the years. STEVE COLL: Yes, and directly to ISI, because the main—we had a long-standing alliance with Pakistan, tried to provide, you know, humanitarian aid and so forth, over the decades, but it was the Soviet war that really changed the character of the relationship by bringing ISI’s role in this kind of covert war to the forefront of the alliance. NERMEEN SHAIKH: Well, I mean, there’s—it’s quite remarkable, the shift that happened in U.S. policy vis-à-vis precisely ISI. I mean, they used, as you’ve said, ISI to funnel all these funds and arms to the Mujahideen during the Soviet occupation. But in documents leaked in April 2011 by WikiLeaks, the U.S. government described the ISI as a terrorist organization on par with al-Qaeda and the Taliban. So, could you give us a sense of what accounts for this massive shift? STEVE COLL: Well, it was the experience of being on the receiving end of ISI covert action after the U.S.-led war to overthrow the Taliban in 2001. So, you know, the Taliban fell in December of 2001. The Bonn Agreement established a new constitutional government in Afghanistan. Hamid Karzai was elected president. A parliament was elected. Afghans came home from abroad. There were a couple of years of relative peace. And then the war started again. And initially, I think, the United States, which was distracted by Iraq, had gone off and invaded Iraq, was trying to turn—the Bush administration was trying to turn the war over to NATO allies. They didn’t really see ISI coming for a while. But, gradually, the Taliban revived. Gradually, it became apparent to U.S. officials, who would go over and try to study what’s going wrong with this war, that ISI was back in action, that the Taliban were receiving not just physical sanctuary inside Pakistan, but material support, maybe training, that they seemed to be getting more and more sophisticated. They started to attack Afghan forces. They started to attack Canadians and Brits and carrying out terrorist bombings in cities. And then the U.S. escalated the war, right? So, at the end of the Bush administration and then the first years of the Obama administration, we sent tens of thousands of U.S. combat troops back to Afghanistan to try to finish the war, much as you quoted President Trump saying he was going to do. You know, “This time we’re going to get it done.” And it was at that time—you were quoting this document from 2011—that the Taliban started to strike American soldiers, kill and wound thousands. And U.S. commanders became furious. They said, you know, “We’re giving all this aid to Pakistan, but ISI is supporting groups that are attacking and killing our own soldiers.” And that led to assessments like, well, they’re the enemy, they’re the terrorist organization. AMY GOODMAN: Before we break, I mean, Afghanistan cannot be looked at in isolation, in so many different ways, but how the U.S. engaging in the Iraq War, what that meant for Afghanistan, the first Bush war? So, can you talk about this moment, when the U.S. is focusing on Afghanistan, and then Donald Rumsfeld, the secretary of defense, prevails upon Tommy Franks to divert attention from that to deal with Iraq? STEVE COLL: Yeah. There’s a scene in Directorate S where, after the fall of the Taliban, Rumsfeld insists on a light footprint. You know, “I don’t want a big military force there.” But it’s peaceful. There’s a task force. And some American generals come out to set up a kind of peacekeeping and “maybe we’ll chase al-Qaeda” terrorist-hunting operation, just outside of Kabul. And they’re getting themselves organized. They’re called to a conference. This is in 2002. And they go to Europe to this meeting, and they come back, and they say to their comrades, you know, “This war is over. We’re going to Iraq. We’re already going to Iraq.” And this was, you know, months before even the U.S. public first started to get hints that this planning was underway. And, of course, if you’re in the military or you’re in the intelligence services, you know, your career depends on being present at the next big war. So everybody’s attention shifted. And the U.S. basically abandoned Afghanistan in order to carry out the Iraq invasion. And then, of course, we know how well that invasion went, and it bogged down the U.S. for years to come. AMY GOODMAN: We’re going to go to break, and then we’ll come back to this discussion. The U.S. bombing Afghanistan, the beginning of it, October 7th, 2001, just weeks after the September 11th attacks. Many in the U.S. would think that those who piloted the planes into the World Trade Center and the Pentagon were either Afghan or Iraqi. But, in fact, 15 of the 19 people who were in those planes were from Saudi Arabia. This is Democracy Now! When we come back, we’ll talk about many different issues, including what actually happened in Abbottabad, what happened to Osama bin Laden, Mohammed Omar, if you remember him, and much more. Stay with us. AMY GOODMAN: “Cassidy,” performed by The Grateful Dead. The song was co-written by John Perry Barlow, who’s died at the age of 70. Besides being a lyricist for The Dead, Barlow was a leading advocate for a free and open internet. He was the co-founder of the Electronic Frontier Foundation and Freedom of the Press Foundation. This is Democracy Now!, democracynow.org, The War and Peace Report. Our guest for the hour is Steve Coll. He is the author of Directorate S: The C.I.A. and America’s Secret Wars in Afghanistan and Pakistan, just out this week. I’m Amy Goodman, with Nermeen Shaikh. NERMEEN SHAIKH: Well, last month, President Trump became the third president in a row to use his State of the Union address to put a positive spin on the war in Afghanistan, the longest war in U.S. history. PRESIDENT DONALD TRUMP: Our warriors in Afghanistan have new rules of engagement. Along with their heroic Afghan partners, our military is no longer undermined by artificial timelines, and we no longer tell our enemies our plans. AMY GOODMAN: Five years earlier, President Barack Obama predicted at his 2013 State of the Union that the war would soon be over. PRESIDENT BARACK OBAMA: This spring, our forces will move into a support role, while Afghan security forces take the lead. Tonight I can announce that over the next year another 34,000 American troops will come home from Afghanistan. This drawdown will continue. And by the end of next year, our war in Afghanistan will be over. PRESIDENT GEORGE W. BUSH: We remain on the offensive in Afghanistan, where a fine president and a National Assembly are fighting terror while building the institutions of a new democracy. NERMEEN SHAIKH: So that’s President George W. Bush speaking in 2006. We’re speaking with Steve Coll, author of Directorate S: The C.I.A. and America’s Secret Wars in Afghanistan and Pakistan, the sequel to his Pulitzer Prize-winning book Ghost Wars: The Secret History of the CIA, Afghanistan, and Bin Laden, from the Soviet Invasion to September 10, 2001. So, Steve Coll, we spoke earlier, in part one, of the impact of the U.S. decision to invade Iraq on what happened in Afghanistan. So, that was, one could say, the failure—one of the failures of the Bush administration. As you point out in your book, though, President Obama made a shift in policy, first of all, by appointing a special office within the State Department to deal with Afghanistan, Special Representative Richard Holbrooke. And this, people thought, would be a significant shift from Bush’s policy. And you reveal in the book that in 2010 the Obama administration also established a secret cell in the White House called the conflict resolution cell, which was established only to coordinate political negotiations with the Taliban. Now, why did those negotiations never go anywhere? You also say that Mullah Omar wrote a letter to Obama, offering or making it clear that he would be open to negotiations with the Americans. So, what happened with negotiations, American negotiations with the Taliban? STEVE COLL: Yeah, so, direct negotiations with the Taliban lasted about two-and-a-half years, almost entirely in secret. There were occasional reports about what was going on, but most of what was really happening was kept secret. And they fell apart for a variety of reasons. I would name two really important factors. One was that the Obama administration was really divided about the strategy. The military wanted to keep fighting the war. The CIA, more or less, was supportive of the military’s position, skeptical that negotiations with the Taliban would lead anywhere. And so you had this kind of government that was running three policies at the same time. They rationalized it by saying our policy is fight and talk. So, that confused everyone out in the region, but it was at least a way to describe what was going on accurately: They were fighting and talking. But another factor was that Hamid Karzai had lost trust in the United States, after all these years. He kept asking the United States, “Why aren’t you doing more to pressure Pakistan? Why are you sending troops into my villages? Why are you creating civilian casualties?” And eventually, he concluded that the United States must want to destabilize Afghanistan, in order to justify having a military presence there. And, you know, American diplomats would say, “Mr. President, that’s a conspiracy theory. Let it go.” And he would say, “Well, but I can’t understand why you’re conducting the war this way.” So, he, ultimately—Karzai, ultimately, undermined the negotiations with the Taliban. He just felt like this was somehow out to get him, and so he kind of blew up the talks in 2013. Now, since then, the United States, both in the Obama years and possibly into the first part of the Trump administration, has probed for another way forward, with Pakistan or otherwise. You know, we heard the president, in your clip, say, “I’ll never talk to the Taliban.” But if you look carefully at what the Trump administration is saying, they’re saying what the two previous administrations are saying, which is, “We’re not saying we’re never going to talk to them ever, ever. It’s that we’re going to bomb them to the negotiating table. We’re going to defeat them on the battlefield to such a point that they’ll have no choice but to come talk to us.” Well, this was exactly what the military was arguing during the Obama years. It’s not as if we’re against any settlement eventually, but we need to make more progress on the battlefield before we can force them to the negotiating table. And remember Vietnam? That was kind of pretty much the theme of the Johnson administration and the Nixon years. AMY GOODMAN: There were major protests, not only against the Iraq War, before the Iraq War began, but even before the U.S. bombing Afghanistan. Talk about the U.S. doing that on October 7, 2001, and then what happened immediately with Mullah Omar, and then your very detailed and fresh reporting on what happened with Osama bin Laden, how he was in Tora Bora, what happened to him and ultimately being caught in Abbottabad, with or without Pakistani knowledge. And that’s very interesting, how you write about it. STEVE COLL: Right. So, kind of three stories there. I mean, after September 11th, the Bush administration really was blind about where these attacks had come from. They knew that a lot of al-Qaeda leaders were in Afghanistan, so they quickly came up with this plan to try to disrupt them and to—and maybe to destroy al-Qaeda through bombing. And in that plan, there were targets of leadership. One was Mullah Omar. One was Osama bin Laden. AMY GOODMAN: And explain why Mohammed Omar was so important, the one-eyed sheikh. STEVE COLL: Yeah, he was the emir of the Taliban, the unquestioned leader of the—what was then the Islamic Emirate of Afghanistan, the government of Afghanistan, run by the Taliban, recognized as legitimate only by three other governments in the world—Pakistan, Saudi Arabia and the United Arab Emirates. But it was the government of Afghanistan. And so, as the emir, he was—his authority was absolute, with, you know, some shura and ministers that he consulted with, but it was ultimately his decision, war or peace. And, ultimately, Mullah Mohammed Omar said, “You know, it’s God’s will. I cannot turn a fellow Muslim over to American justice. If God wants us to suffer and lose our government, it means that we weren’t doing a very good job in the first place, and we’ll just have to learn our lessons and find our way back.” And so that’s what he ultimately decided to do. AMY GOODMAN: How did he escape? STEVE COLL: So, he—after escaping that night, through this series of poor decisions by the Americans, he survived in Kandahar for another two months. And then, as his government fell, he got on a motorcycle and rode into Pakistan, where he lived until he died in a hospital in Karachi in 2013. There’s a funny scene, because one of the themes of this whole history is that: Are the Taliban independent, or are they just a creature of ISI in Pakistan? Are they just a creature of Directorate S? And, you know, you see, when the negotiations occur with the Taliban, that the Taliban want to see themselves as independent. They don’t want to be clients of Pakistan. They are Afghans, and they would rather negotiate on their own behalf. But when Mullah Omar ultimately dies in this hospital—nobody knows he’s there—the leader of the Pakistan Army is at talks with the Americans, presenting statements that have been supposedly written by Mullah Mohammed Omar. So, the Pakistanis did act as the agent of the Taliban in these negotiations, even while keeping secret the true circumstances of the Taliban’s leadership. I mean, it is—you can’t make this stuff up. I mean, you asked about Osama bin Laden. He escaped from Tora Bora around the same time Mullah Omar got on his motorcycle. And that was a missed opportunity to maybe end the whole narrative of al-Qaeda’s war with the United States and the Bush administration’s war with Osama bin Laden. The main missed opportunity was that it was—he was clear he was up on this mountain at Tora Bora. He was being bombed. But the door to Pakistan was wide open. And the Americans debated: “Should we put troops up there to stop him and to finish this?” And they decided not to, because they were afraid that they would provoke an uprising among local people if they put troops up on that mountain. They also said later, “Well, we didn’t have enough helicopters.” But in the U.S. military, it’s seen as a huge missed opportunity to have ended this whole story about the United States being at war with bin Laden, 10 years before, in fact, he was killed. AMY GOODMAN: And then, bin Laden in Abbottabad and what happened? And Pakistani knowledge or not? NERMEEN SHAIKH: Well, let’s go back to what you were talking about earlier, President Hamid Karzai and the falling out with the U.S., because one can say that that’s one of the definitive reasons that no political negotiation has been possible. And one of the things that your book does is it gives an account of Karzai which is not really representative of a lot of U.S. writing on Karzai, where he’s seen, more or less, as a conspiracy theorist, who’s always been opposed to U.S. interests. And you say in the book that when he first became the leader of Afghanistan in December 2001, he was celebrated here in the U.S. as an Afghan Mandela, but by the time he left office, 13 years later, he was viewed more as an Afghan Mugabe. So, could you explain what accounts for that quite radical shift in perspective on Karzai? STEVE COLL: Several things. And the first was that he just could not understand what the U.S. was doing with Pakistan. And when I—I had interviewed him. You know, I’ve covered this story as sort of a magazine writer, almost as a beat reporter. But when I went back and tried to dig out the records and interviewed people and found notes of all the conversations with Karzai over the years, it was so striking that almost every time an American came to visit him, he said, “What are you doing about ISI? What are you doing about Directorate S? Why are you pursuing these counterinsurgency strategies? The real war is to try to change Pakistan’s conduct.” And the Americans would say, “Yes, Mr. President, we understand. You know, Pakistan is also an important ally. They’re doing their bit.” And over the years, he just could not understand what the U.S. was doing. And he finally concluded that they were deliberately collaborating with Pakistan in order to undermine Afghanistan’s independence and security, in order to establish a long-term U.S. military presence in the country. He really lost faith. The second reason was because of the way the U.S. conducted the war. He just—he was the sovereign leader of Afghanistan. He did not support the counterinsurgency campaign, that involved sending U.S. troops into Afghan villages, breaking down doors, you know, rounding up people, putting them in detention. He wanted a war that was focused on the border, to try to secure the Pakistan border to prevent militants from coming into Afghanistan. He wanted a war that was, you know, about the basic security of Afghanistan, the cities, American troops on bases supporting Afghan forces. And he didn’t believe that the Taliban were an insurgency. And when the Americans would come in and show these long PowerPoint presentations about how they were going to use counterinsurgency doctrine to win the hearts and minds of the Afghan people, President Karzai would say, “That’s not the war I want to fight.” But the Americans went ahead anyway. Essentially, he was not in a position to stop them. And he resented being their vassal. And the more he felt like he was not in control, the angrier and the more defiant he got about the United States. AMY GOODMAN: And the more he was made out to be a madman, even by the U.S. media. STEVE COLL: Yes. And, you know, in fairness, he was—he was untethered, as he felt like he had lost his position, lost control of his own office. But he wasn’t a madman. He was just confused and angry and also trying to demonstrate his independence. And sometimes that was interpreted by the U.S. media, the Western media, as, “Oh, he’s erratic, or he’s off his meds.” No, he was trying to demonstrate to his own people that he was not a lackey of the United States. And those words were hard for Americans to hear. AMY GOODMAN: Your chapter on torture begins with the quote, “His rules were different than our rules,” as you talk about somehow the Bush administration wanting to win the hearts and minds of the people of Afghanistan, which would make most laugh, if they weren’t crying in bitterness and horror and pain. What about what happened in Afghanistan, the torture cells, the prisons? STEVE COLL: Yeah, I thought it was important to write a version of the torture history that was set in Afghanistan, because, you know, a lot of what Jane Mayer and Dana Priest and a lot of other investigative reporters uncovered a decade ago about the secret prisons and the enhanced interrogation techniques against al-Qaeda prisoners offshore, in places like Thailand and Morocco and so forth, that was one regime of torture. What happened in Afghanistan was like a much more thuggish and much more politically consequential version of the same regime. STEVE COLL: No, of course. AMY GOODMAN: —what the U.S. and CIA did, the torture chambers they built and set up. STEVE COLL: Yeah, well, there were—you know, there’s a whole archipelago in Afghanistan by 2005 of detention facilities, some run by the Afghan security service, some run by the Americans, some run by the military, some run by the CIA. There are a couple of documented cases of either murder or death by neglect in the CIA facilities. But, you know, a lot of the Afghans would say, “I’d rather be put in the American facilities, for all the trouble I’ll get, than be in the Afghan ones.” And it was really a—and the Afghans who were detained, under suspicion, they understood that the Afghan security service was essentially a client of the United States. So it was—it all had the same kind of effect. It was a time when the CIA officers in the field and, to some extent, the Special Forces officers, though they still were subject to the Uniform Code of Military Justice and were a little more cautious, they felt a sense of impunity. That’s what—”His rules were different than our rules.” That’s a quote from a military sergeant who watched the murder of—the main case that I write about there, testifying in the accused’s murder trial. And the prosecutor says, “Well, you know, what did you think was going on as you stood outside this hut and listened to the thuds of this guy being beaten to death?” And he said, “Well, he told us his rules were different than our rules.” And that was a metaphor for what happened in the years between, you know, 2002 and 2007 or so. NERMEEN SHAIKH: —they were quite different. And also the relationship to the Mujahideen? Because the Mujahideen, who fought the Soviets during the occupation, were not just Afghan nationals. I mean, there were lots of Arabs and other Muslims who came from across the world to fight the Soviets in Afghanistan, and many have questioned where they went afterwards and how many of them came to constitute al-Qaeda or the Taliban. STEVE COLL: Right. So, the Taliban are Afghans. They are Afghans. They come from Afghanistan. They formed in Afghan villages in southern Afghanistan. As you know, Nermeen, the Afghanistan’s ethnicity is a sort of polyglot. But one of the largest groups are the Pashtuns, speak a distinctive language, Pashto. And the Taliban emerged from Pashtun villages and areas of Afghanistan. NERMEEN SHAIKH: Afghanistan and Pakistan. STEVE COLL: And Pakistan. You know, not all—and especially refugee camps in Pakistan, but also the tribal areas. Not all Pashtuns are Taliban, by any means. But all Taliban, at least for a long time, were Pashtuns. So they represented a kind of nationalism in those communities. But they were indigenous. I mean, they were not international terrorists or militants. Now, among them were the Uzbeks and the Arabs and the Chechens and other groups that migrated to Afghanistan in order to participate in an international uprising against the United States and its allies. And the relationship between the Taliban and al-Qaeda was never clearly understood. There was no agreement in the U.S. system about how to understand that relationship. There were some—and this is a recurring theme in Directorate S. You know, you get into the Situation Room. They have all the intelligence on the table. The Cabinet is assembled. And they have these long arguments. “Well, is the Taliban the same as al-Qaeda?” You know, hardly anyone, except the intelligence briefers, has even been to Afghanistan. And so they’re trying to—they have—they go through these education sessions. “These are where the Pashtuns live. This is the relationship between the Taliban and the Pashtuns. These are the Arabs.” And then, a really substantive argument. Well, no, the Taliban are not the same as al-Qaeda, but they have some kind of tense, sometimes accommodating, relations with one another. But the big difference is that the Taliban aren’t going anywhere. And also, the Taliban have never declared war on the United States, even after September 11th, even after the U.S. overthrew the Taliban regime. Except to liberate Afghanistan, the Taliban did not conspire with al-Qaeda to attack London or to attack Spain or to attack New York. They were very clear that they did not—if they came back to power, they did not want to be a rogue state again, because that hadn’t worked out very well the first time. AMY GOODMAN: And so, if any leader wanted to end this war, they would have to negotiate with the Taliban, the indigenous leadership of Afghanistan. STEVE COLL: Yes, and also the neighbors, who—you know, because Afghanistan has always been shaped by interference from outside countries, at least since the Soviet invasion. So you would have to deal with the Taliban. You’d have to deal with Pakistan. You’d have to deal with China, Russia, Iran. AMY GOODMAN: And we’ll talk about that in a minute. Steve Coll is our guest. The Pulitzer Prize-winning journalist has just written a sequel to his Pulitzer Prize-winning book, Ghost Wars. It’s called Directorate S: The C.I.A. and America’s Secret Wars in Afghanistan and Pakistan. Stay with us. AMY GOODMAN: “Everybody Knows” by Leonard Cohen. This is Democracy Now!, democracynow.org, The War and Peace Report. I’m Amy Goodman, with Nermeen Shaikh. Our guest for the hour is Steve Coll, author of Directorate S: The C.I.A. and America’s Secret Wars in Afghanistan and Pakistan. We chose that music break, Leonard Cohen’s “Everybody Knows”—”Everybody knows the dice are loaded/Everybody rolls with their fingers crossed/Everybody knows the war is over/Everybody knows that the good guys lost“—because it’s the epigraph of this book. Why, Steve, did you start with this? STEVE COLL: Well, it’s a great—it’s a great lyric, but the reason is because there’s a character in the book, a scholar of Afghanistan, who tried to advise the Obama administration about negotiations with the Taliban and with region governments, named Barney Rubin. And I’ve interviewed him. And I was interviewing him at one point, and I asked him, “Well, what were you doing on the day that bin Laden was killed in Abbottabad, Pakistan?” And he said, “Well, I was in Kabul. I was in a meeting. And I was listening to the briefers drone on. And I was writing in my notebook, and I just wrote down these Leonard Cohen lyrics.” And this was the day before May 1. And I just had—that always—that scene of him, this kind of bearded scholar, writing down the Leonard Cohen notes in the middle of a tedious embassy meeting just seemed like a pretty good—stayed with me. So then I chose those lyrics as the epigraph. NERMEEN SHAIKH: Well, that scholar, of course, was Barney Rubin. NERMEEN SHAIKH: Who worked for years with Richard Holbrooke. AMY GOODMAN: Now, earlier, you were talking about why it’s so important that Afghanistan’s—the countries surrounding Afghanistan are crucial to any kind of a settlement. And one of the key things—I mean, your book is, after all, taken from—the title is taken from a branch within Inter-Services Intelligence, the intelligence service of Pakistan. It’s long been clear to the Americans that Pakistan is absolutely central to any resolution of the conflict. And multiple American administrations—the Bush administration, the Obama administration, and, presumably, the Trump administration also, even though he’s made comments recently very critical of Pakistan. But in 2008, to go back to the Bush administration, very early on, the Bush administration signed a nuclear agreement with India, which is, of course, the historic enemy of Pakistan. Now, given the fact that the Americans were aware that Pakistan’s participation was absolutely crucial to reaching peace in Afghanistan, why do you think that the Bush administration made such a provocative decision? STEVE COLL: I don’t think they thought through the consequences for the Afghan War. In hindsight, we can see that they were significant, because, as you say—I mean, it’s important to, you know, remind your viewers and listeners, from Pakistan’s point of view, it’s all about India, right? So, if anything—they’ve fought three wars with India. The reason that they are supporting the Taliban, primarily, is to keep India’s influence in Afghanistan in check. And they really see the world in a zero-sum way in regard to India’s influence in their neighborhood. So, when the United States embraced India in this strategic nuclear deal, which essentially forgave India for breaking the Nonproliferation Treaty and developing an atomic weapons capability, and then they said to Pakistan, simultaneously, “By the way, we’re giving this sweetheart deal to India. We’re not giving it to you, because you don’t have the record that would justify us doing this,” well, you know, the Pakistani high command looked at that and said, “OK, you’ve made yourselves plain. You are a close ally of our enemy, India, strategic ally, for the next decades. And we’re not. And so, we should get ready to defend our own interests in this neighborhood.” And I think, you know, it was a factor in shifting sentiment within the ISI, and particularly in the Army high command. The combination of the India nuclear deal and the U.S. essentially pulling out of a commitment to the Afghan War, because of the quagmire in Iraq, turning the war over to NATO governments, you know, ISI looked at that and said, “You know, we should start preparing for a post-American Afghanistan. You know, we’re already—we’re already there.” And for them, historically, that had meant the Taliban had to have a role. AMY GOODMAN: I wanted to ask you about the just enormous impact of the war in Afghanistan—that’s what people in the United States don’t learn about—I mean, for these people. We keep talking about the longest war in U.S. history, the number of U.S. soldiers lost. But what about the toll on the people of Afghanistan? If you could talk about this and the devastation of this country, and also this remarkable story you tell about 2012, the CIA officer Marc Sageman carrying out an investigation into murders in Afghanistan and what this told the United States? STEVE COLL: Yeah, I mean, you know, when you go back through all of this into one kind of volume of history, you know, one thing that’s really striking, that I hadn’t thought about until I got to the end of the project, the war really stabilized all three countries—destabilized all three countries. It destabilized the United States, it destabilized Afghanistan, and it devastatingly destabilized Pakistan. I mean, Pakistan had the worst years of terrorism the country has ever known. Why? Because al-Qaeda fled over the border, during the U.S. bombing, into Pakistan, collaborated with local radicals and then, ultimately, turned against the Pakistani state. Tens of thousands of Pakistanis died in the mid-2000s—after 2007 up 'til about 2012. Car bombs in major cities, things the country had never known. Now, if you're a Pakistani, you look at this and say, “Why is this happening?” All right, we can blame ISI. They’ve suckered these groups. They’ve been complicit with these groups for many years. But also, the American war spilled into this country. They didn’t invite the American war. They advised against it. In Afghanistan, you know, Hamid Karzai says, “Take a lighter footprint. Stay on your bases. Go on the border. Stop dropping so many bombs indiscriminately. We’re not going to win hearts and minds the way you’re fighting this war.” The Americans go about it their way, and thousands and thousands of Afghan civilians die, tens of thousands of security forces die. And the war is a stalemate. You know, one of the—the CIA draws up these maps every six months, where they color all the districts of Afghanistan in different colors to say whether the government controls it and or the Taliban controls it or it’s contested. And over the course of a decade, despite the presence of 150,000 first-rate international combat troops fighting the Taliban in Afghanistan, the colors essentially don’t change. And they’re really not much different today. And if anything, the Taliban probably have come back a little bit in the countryside. And, you know, there are reasons why the war is a stalemate from a military perspective. But in a bigger-picture sense, it’s a grinding price that Afghan civilians are paying for this. STEVE COLL: —Afghans aren’t working on this, you know? AMY GOODMAN: And the U.S.? Trump? STEVE COLL: Trump is not interested in diplomacy. That seems evident, on a global basis. AMY GOODMAN: We’re going to leave it there. And people can pick up the book and find out the other remarkable stories that this book is chock full of, Directorate S: The C.I.A. and America’s Secret Wars in Afghanistan and Pakistan, the sequel to Steve Coll’s Ghost Wars: The Secret History of the CIA, Afghanistan, and Bin Laden. Professor Coll is dean of the Graduate School of Journalism at Columbia University.